The purpose of this paper is to introduce a technology integration model designed to assist pre-service teachers to learn meaningful uses of technology in K–12 classrooms. Based on studies in teacher education, learning theory, and technology integration, the authors define five essential characteristics necessary for pre-service teacher education: (a) providing concrete experience, (b) promoting reflection, (c) assisting knowledge application to actual practice, (d) creating communities of learners, and (e) developing Technological Pedagogical and Content Knowledge (TPACK) (Mishra & Koehler, 2006; Thompson & Mishra, 2007-2008). The Situated Technology Integration (SiTI) model was developed based on these characteristics. This paper explains the SiTI model in detail and shares data on its implementation processes. Hur, J.W., Cullen, T. & Brush, T. (2010). Teaching for Application: A Model for Assisting Pre-Service Teachers With Technology Integration. Journal of Technology and Teacher Education, 18 (1), 161-182. Waynesville, NC USA: Society for Information Technology & Teacher Education. Retrieved April 20, 2019 from https://www.learntechlib.org/primary/p/29461/. Dexter, S., Doering, A. H., & Riedel, E. (2006). Content area specific technology integration: a model for educating teachers. Journal of Technology and Teacher Education, 14(2), 325–345. Doering, A., Hughes, J., & Huffman, D. (2003). Preservice teachers: are we thinking with technology? Journal of Research on Technology in Education, 35(3), 342–361. Ertmer, P. (2005). Teacher pedagogical beliefs: The final frontier in our quest for technology integration? Educational Technology Research and Development, 53(4), 25–39. Goldman, S. R. (2001). Professional development in a digital age: Issues and challenges for standards-based reform. Interactive Educational Multimedia, 2, 19–46. Howard, J. (2002). Technology-enhanced project based learning in teacher education: addressing the goals of transfer. Journal of Technology and Teacher Education, 10(3), 343–364. Kariuki, M., & Duran, M. (2004). Using anchored instruction to teacher preservice teachers to integrate technology in the curriculum. Journal of Technology and Teacher Education, 12(3), 431–445. Korthagen, F. A. J., & Kessels, J. P. M. (1999). Linking theory and practice: Changing the pedagogy of teacher education. Educational Researcher, 28(4), 4–17. Kozma, R. B. (2003). Technology and classroom practices: an international study. Journal of Research on Technology in Education, 36(1), 1–14. Krippendorff, K. (2004). Content analysis: An introduction to its methodology (2nd ed.). Thousand oaks, Ca: sage Publications. Li, Q. (2005). Infusing technology into a mathematics methods course: any impact? Educational Research, 47(2), 217–233. Mishra, P., & Koehler, M. J. (2006). Technological pedagogical content knowledge: a framework for teacher knowledge. Teacher College Record, 108(6), 1017–1054. Office of Technology assessment (1995). Teachers and technology: Making the connection. Washington, DC: U.S. Government Printing office. Parana, J., West, A., Johnson-gentile, K. & Longerger, R. (2000). Preparing preservice teachers for the technological classroom: a school—college partnership. Technology and Teacher Education, 8(2), 97-109. Perry, G., & Talley, S. (2001). Online video case studies and teacher education. Journal of Computing in Teacher Education, 17(4), 26–31. Pierson, M. E., & Mcneil, S. (2000). Preservice technology integration through collaborative action communities. Contemporary Issues in Technology and Teacher Education, 1(1), 189–199. Pope, M., Hare, D., & Howard, E. (2002). Technology integration: Closing the gap between what preservice teachers are taught to do and what they can do. 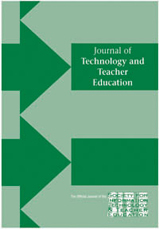 Journal of Technology and Teacher Education, 10(2), 191–203. Sadera, W. A., & Hargrave, C. P. (2005). Conceptual change in pre-service teacher technology preparation. In C. Varsidas & G. V. Glass (eds. ), Preparing teachers to teach with technology. Greenwich, Co: Information age Publishing Inc.
Sherry, L., & Chiero, R. (2004). Project TalenT: Infusing technology in K–12 field placements through a learning community model. Journal of Technology and Teacher Education, 12(2), 265–297. Thompson, A. & Mishra, P. (2007-2008). Breaking news: TPCK becomes TPaCK. Journal of Computing in Teacher Education, 24(2), 38-39. Zeichner, K. M., & Liston, D. P. (1987). Teaching student teachers to reflect. Harvard Educational Review, 57(1), 23–48.